Musical Ecologies continues Thursday December 10 with New York-based Argentinean composer Marcelo Toledo. Known for his complex, timbral-based compositions, Toledo will discuss his work as it relates to music notation and the visual representation of sounds. Following the presentation, clarinetist Vasko Dukovski will perform Toledo’s Entrañas/Descentros for solo clarinet and then together with the composer, the two will perform an improvisation. The evening will begin with a conversation hosted by series curator Dan Joseph, and a reception will follow. 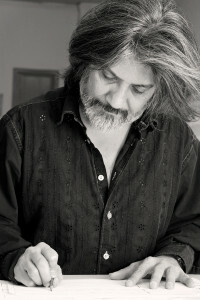 New York-based Argentinean composer Marcelo Toledo has developed a personal musical style oriented towards the exploration of instrumental timbre, complex sounds, and new instrumental techniques. In his work, he has eliminated almost completely the traditional importance given to pitch in order to focus on a new aural matter which is the product of his personal research on all the instruments of the orchestra. In Toledo’s work, sounds evolve almost biologically in an intricate timbral texture made out of complex fluid sounds. A 2013 NYFA Fellow, and 2009 DAAD Artist in Residence in Berlin, Toledo has received commissions from a number of European, North American, and Latin-American ensembles, museums, institutions, and new music festivals, including the South West German Radio, The Essl Museum in Vienna, Center Pompidou, IRCAM, Musik der Jahrhunderte, Ensemble Intercontemporain, New Music Summer Festival Stuttgart, Ultraschall Festival in Berlin, Wien Modern, Berlin Poesie Festival, Ensemble Counter)induction (NY), and Ensemble Recherche, as well as from a number of renown soloists performers such as Claire Chase, Rebekah Heller, Eva Böcker, David Nuñez, Miranda Cuckson, Vasko Vokovski and Theo Nabicht. Comments closed — Trackbacks closed RSS 2.0 feed for these comments This entry (permalink) was posted on Friday, November 20, 2015, at 1:56 pm by Dan Joseph. Filed in press release.